Alexander Grischuk has been 12 minites late for his game of the final round of the Petrosian Memorial, and that was probably the most interesting moment in the whole short encounter. His opponent Vladimir Kramnik, who was Black, could have reached Grischuk and even win the Memorial in case he won, but the real fight hasn't even begun: the opening by Kramnik wasn't too convincing, and he had to go for the repetition already on move 11, in order to avoid problems. Kramnik: 'I didn't expect the Catalan Opening, that's why I decided to go for a sharp line. Not that I was craving for the victory - I just wanted to get the chance, that's why I played 5...c6. I had already played it once against Topalov, and I had even won. Objectively speaking, this line is risky for Black, but I was hoping to take Grischuk by surprise. Out of his 7 games in Moscow, Alexander Grischuk has won 4 and drawn 3. 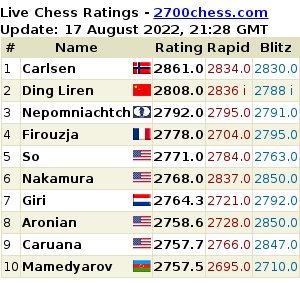 His success has also allowed him to reinforce his 3rd rank in the FIDE rating list with the live rating of 2809.7. 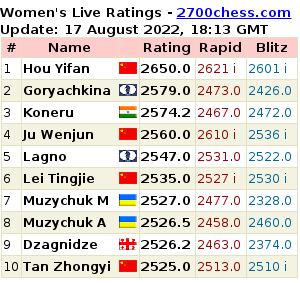 Here are all the games by the Petrosian Memorial winner.